After a light-hearted Twitter exchange started by Full Tilt Poker pro Gus Hansen where he posted a link to the memorable hand on High Stakes Poker where he coolered/bad-beat Daniel Negreanu by hitting a one-outer to make quads on the turn (Daniel flopped a better set and made a full house) Daniel responded with a few jabs of his own, followed by a “Challenge Match”, pitting Team PokerStars Pro against Team Full Tilt Poker. Daniel issued the challenge via his Vlog channel on YouTube, after initially hinting at it on Twitter. Daniel’s challenge was pretty straightforward: Daniel would pick two additional members of Team PokerStars Pro to take on the three Team Full Tilt pros, Gus Hansen, Viktor Blom, and Tom Dwan. The matches would be heads-up clashes and take place at the upcoming EPT London tournament series; the team that wins two out of three matches would be declared the winner. The initial exchange seemed harmless enough (some have expressed their doubts as to the legitimacy of the “twitter feud”, thinking the exchange was little more than a clever setup for the match) with Gus linking to the High Stakes Poker hand followed by a fairly funny needle from Negreanu, where he congratulated Gus on his 2013 graph before mockingly rescinding, saying he didn’t realize he was looking at it upside down. From there the exchange devolved into the typical Challenge Match talk, and now Daniel Negreanu is awaiting the confirmation from Gus Hansen that both Tom Dwan and Viktor Blom are down for the match, while at the same time he is taking suggestions on who to pick to round out his trio. So far he has narrowed it down to Eugene Katchalov, Vanessa Selbst, Jason Mercier, Bertrand “ElkY” Grospellier, and Ike Haxton. 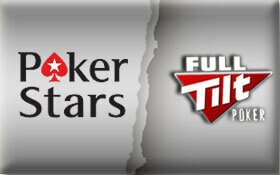 The EPT London is already one of the biggest tournament series in poker, and the addition of a high-stakes heads-up challenge match between Team PokerStars and Team Full Tilt Poker should add even more excitement for poker fans. Chances are the match will be available on a live stream of some sort as well. For the conspiracy theorists out there it does look like the heads-up matches could be manufactured: After all Full Tilt Poker and PokerStars are owned by the same parent company, and PokerStars has already pulled a similar move when they parted ways with Viktor Blom only to see him land at Full Tilt Poker soon thereafter –Full Tilt is of course where Viktor Blom first made his name in poker. The vlog also touches on the incredible fundraising efforts for St. Jude’s Hospital that Daniel spearheaded over the past week or so, including a thank you video from some of the kids who will benefit from the $280,000 that was raised.